Rolling Stone (p.78) - 4.5 stars out of 5 -- "Think of this SMILE as Wilson's first solo album, with those voices as golden brush strokes....There is delight and confidence in Wilson's exchanges with his studio crew." Rolling Stone (p.75) - Ranked #1 in Rolling Stone's '10 Best Reissues Of 2011' -- "The outtakes take you into Wilson's imagination before it shut down in disappointment." Spin (p.82) - "Brian Wilson's vision always was more aligned with America's myth than its reality....He sees it end to end, from pilgrim hymnals and banjo-led frontier songs to Hollywood's version of the Wild West..." Spin (p.51) - Ranked #1 in Spin's 'The Top 10 Reissues Of 2011' -- "[M]ore of a dazzling masterpiece than the original might've been -- America through a prism before rock'n'roll deflowered it." 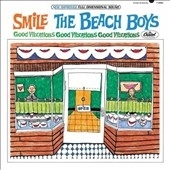 Billboard (p.40) - "THE SMILE SESSIONS captures Wilson, session musicians and the Beach Boys in moments that are chaotic, loopy and remarkably in synch. It's a consistently brilliant album." Record Collector (magazine) (p.89) - 5 stars out of 5 -- "There's clarity and dynamism here....There are surprises which have, until now, been hidden away on bootlegs, such as the discarded, jazzed-up version of 'Wonderland'..."